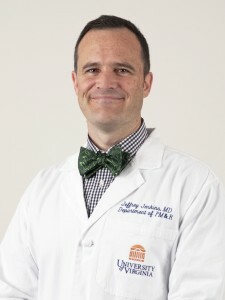 Dr. Jeffrey Jenkins is the director of the PM&R department’s electrodiagnostic laboratory and serves as the Program Director of the UVA Physical Medicine and Rehabilitation residency training program. A Northern Virginia native who attended Columbia University as a National Merit Scholar, Dr. Jenkins is a graduate of the Georgetown University School of Medicine. He arrived at UVA in 1998 to pursue residency training, made a home in Charlottesville, and joined the departmental faculty in 2002. Dr. Jenkins is very active in both resident and medical student education at UVA. He currently serves as the chair of the medical school’s GMEC Education Subcommittee, and he was honored with induction into the University’s Academy of Distinguished Educators in 2006. Dr. Jenkins practices electrodiagnostic medicine, employing specialized nerve testing to diagnose and evaluate neuropathy, nerve entrapment syndromes, and nerve injuries. He has been recognized for clinical excellence with a place on the list of Best Doctors in America and has been named a Castle Connolly Top Doctor. In his limited spare time, Dr. Jenkins enjoys reading, playing soccer, and spending time with his family.